Muslims are jihadis. Muslims subjugate women. Muslims stone adulterers. Sound familiar? Perhaps as familiar as Jews are stingy and control the media, Irish are drunks and raise one child to be a priest or nun, and blacks are ignorant and want special treatment. These ethnic stereotypes are held by people who don’t know. If you know some Muslims or Jews or blacks you know that they’re just people, some like the stereotype, most not. I was raised in segregated Delaware and went to segregated schools. The first black family I knew was the Huxtables: obstetrician Cliff, attorney Clair, dyslexic son Theo, and normal daughter Denise, from The Cosby Show. The first Jewish family many people of my generation knew was the Goldbergs, Molly and Jake and their kids Rosalie and Sammy. And the first Indian-Americans many people knew were Gogol Ganguli and his parents, Ashima and Ashoke, from The Namesake. 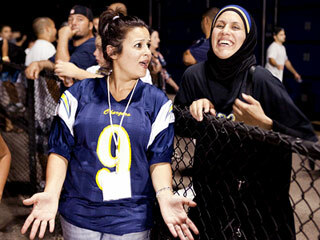 Most Americans don’t know any Muslims, even though there are almost three million Muslims in America. You can meet several Muslim families from Dearborn, Michigan on All-American Muslim, telecast Sunday nights on the TLC channel. It’s always upsetting when one of your heroes turns out to be an unethical creep. I was sick when I learned—for certain—that Bill Clinton had lied to me on national TV, sad when I learned that my Dodger hero, Manny Ramirez, had used banned substances, and devastated when my biggest hero of all. Greg Mortensen (of Three Cups of Tea fame) had not really built girls schools in Taliban country and had in fact stolen millions from his non-profit. Still, I’m not getting used to my heroes falling. 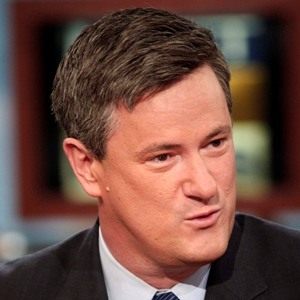 Not even after the latest, Joe Scarborough, conservative ex-congressman (R-FL) and host of the fun morning political conversation, Morning Joe. 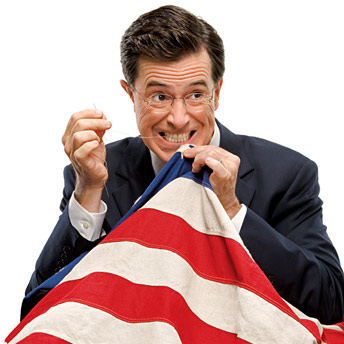 Thanks again to Islamophobiatoday.com for tipping us off to this expose by the Colbert Report of the threat to America from creeping Sharia, along with flying robot drones and crystal meth-laden vacuum cleaners. 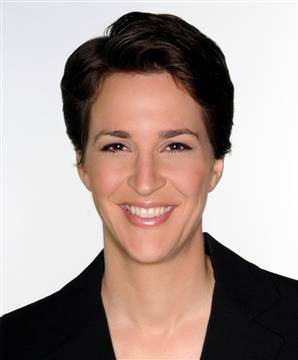 Maddow followed this clip with video of Condoleezza Rice admitting to the 9/11 Commission that the President’s Daily Briefing for August 6, 2001, was entitled, “Bin Laden Determined to Attack Inside the United States.” Maddow punctuated the segment this way: “George W. Bush is trying to sell the same kind of spin he tried to sell when he was President.” That is, in her words, “a whopper.” For extra emphasis she repeated the clip of Bush saying no intelligence and Rice reading the title of the PDB. In the search for diverse opinions on television I like MSNBC’s Morning Joe, an entertaining roundtable of people you would enjoy having at your next dinner party. Hosts Joe Scarborough—a conservative former Congressman—and Mika Brzezinski—a liberal daughter of President Carter’s National Security advisor—are politically balanced while being friendly and civil. Their guests span the political spectrum, and the conversations are usually spirited. Nobody on the show claims to be objective, they just bounce their opinions off each other. Fun and informative. “I would argue that nobody is objective in journalism: that we all come from our own world views and our own backgrounds and our own political affiliations, and we’ve voted for Presidents, and you know what! It’s time to be honest [about it}—and then we can be trusted. Dr. Laura Schlessinger is ending her radio show at the end of the year, nudged along by the furor over her repeated use of the “n-word” in a conversation with a caller. Dr. Laura repeated the word six or seven times, not in a racist way, but in a complaint about a double standard whereby black comics can use it ad nauseum, but it’s off limits to whites. “I talk every day about doing the right thing. And yesterday, I did the wrong thing. I didn’t intend to hurt people, but I did. And that makes it the wrong thing to have done. 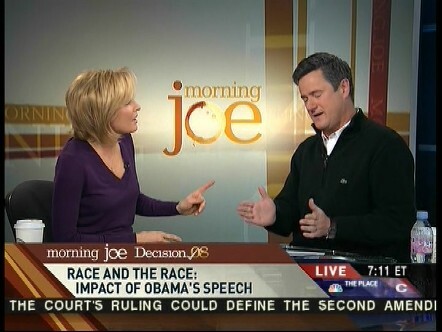 My favorite TV program is MSNBC’s Morning Joe. The hosts are conservative ex-Congressman Joe Scarborough, liberal television journalist Mika Brzezinski, and humorist/sports fan Willie Geist. While their politics are very different, they are intelligent and good natured as they talk about the world. 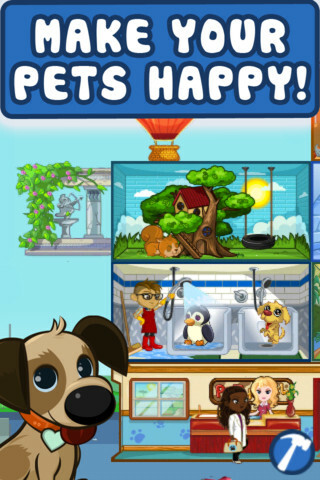 They have interesting and nice guests—the kind of people you’d enjoy having over for dinner. So I was disappointed Wednesday morning when, after Mika introduced a report by NBC reporter George Lewis on the threat to public health posed by super-sized restaurant meals, Joe and Willie and guest Mike Barnicle started clowning and joking about how great it was to eat huge meals at the restaurants identified by the Center for Science in the Public Interest as contributing to America’s epidemic of obesity. 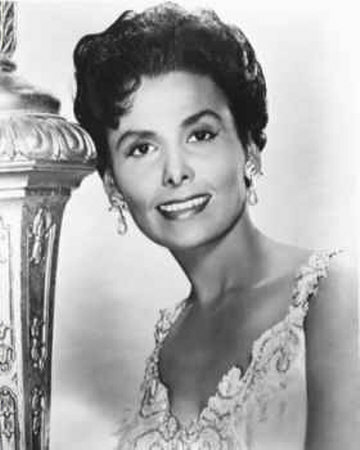 Lena Horne died last week at 92. I only knew of two prominent African-Americans when I was growing up in segregated Wilmington, Delaware. One was heavyweight boxing champion Joe Louis, and the other was singer Lena Horne. I knew she was a good singer, and quite beautiful, but I didn’t know anything else. I’m indebted to Jack Marshall’s EthicsAlarms.com blog for educating me about her groundbreaking role in the civil rights movement. Marshall called Horne “Ethics Hero Emeritus” for her relentless fight against segregation and her principled refusal to play demeaning roles in the racist Hollywood environment of the 1930s, 1940s, and 1950s. Her career suffered, and she finally left Hollywood for Europe, where people didn’t seem to care much about her skin color. There’s a fascinating PBS Fresh Air program, broadcast on May 14, that replays an interview that host Terry Gross conducted with Horne’s daughter, Gail Lumet Horne, in 1986. Listen to it for an inspiring story of this heroic woman.